Basecamp™ (Basecamp is a trademark of 37signals) is a basic todo-list management tool. If you are reading this section probably you decided to change management tool: well, Twproject supports importing projects and resources from a Basecamp account. 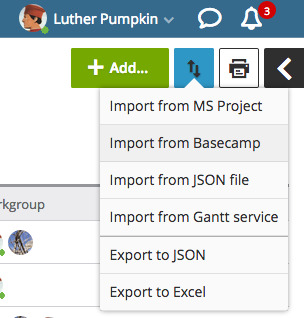 To start importing, go to the “projects” page and click on I and select import: Basecamp. In the first block you have some hints on how Basecamp entities will be mapped in Twproject. Then there is the “resource” import part. Here for every Basecamp “resource” you can decide whether to create a new resource or simply map it to an existing one. The last part is relative to projects import. You should check the task that has to be imported. Then by pressing on “go” button you will proceed with the real import (it may take a while – don’t refresh the page). We strongly suggest revising all the task and resources created after import.